Rush-Co Tailored Covers | Wind Energy Products, Affordable & Flexible. Rush-Co offers innovative tarping and cover solutions for today’s growing wind energy industry. 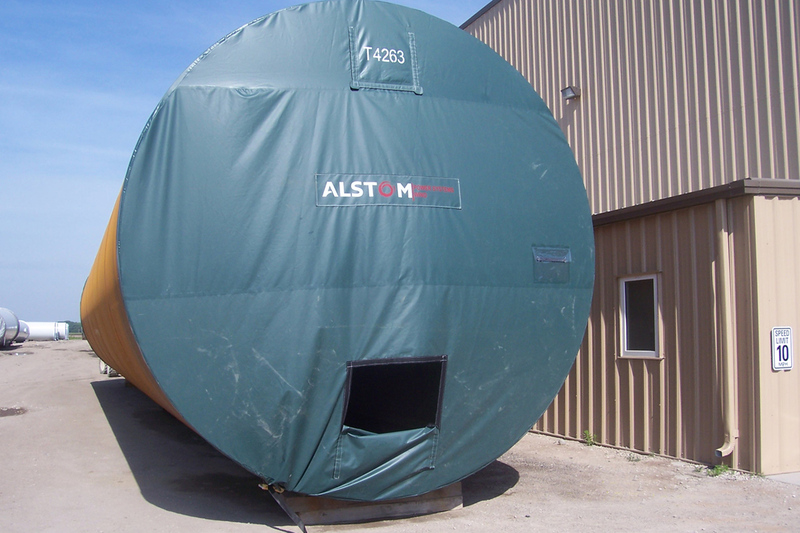 An expert in cover design and manufacturing for over 50 years, Rush-Co manufactures customized covers for transporting wind energy equipment as well as on-site storage of components. Contact us today to get a quote and lead time information at 1-866-776-5617. Rush-Co tower covers provide superior protection for wind tower sections during the transportation process and for on-site storage at the manufacturing facility or wind farm location. Our experienced staff will work closely with you to develop a solution that balances the cost of the project with your expectations of performance. Not all projects are completed on time; delays happen. Towers, nacelles, turbines and blades are not always put up immediately upon arrival. This creates a need for protecting your assets at the construction site, and Rush-Co has a variety of affordable options for stationary storage as well. Different designs and transportation methods call for different coverage methods. Rush -Co provides affordable and reusable covers – an ideal replacement for shrink wrap or other one-time use options you then have to discard. Tap into our extensive knowledge of fabric and material selections available for your particular tower cover needs.